Star SU pressure coolant reamers utilize pressurized coolant to force chips ahead of the tool to produce ultra-smooth, ultra-precise holes. They can be effectively applied in the production of precision holes to tolerance of 0.0005” and less in steel, cast iron, malleable iron, nodular iron, aluminum, bronze and exotic materials. Ideally adapted to the sizing and enlarging of previously drilled or cored holes, Star SU reamers provide higher penetration rates and closer size tolerance. They have a longer tool life than carbide reamers without pressurized coolant and have no tendency to follow pre-drilled or cored hole surfaces. Thus, they can product precise, straight holes. Star SU reamers are made in sizes from 3/16” to 4” in diameter. Cutting speeds are the same as those recommended for multiple flute gundrills. 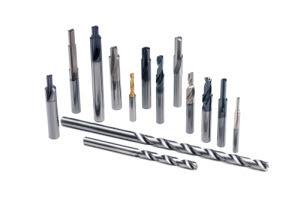 When drilling steel and exotic materials, speeds are from 65 to 500 sfm, with feeds from 0.001” to 0.003” per flute. Coolant (sulfur-chlorinated oil or equivalent) pressures range from 150 psi for aluminum to 350 psi for steel. In blind hole applications the coolant hole in the reamer is in the center of the tool tip and chips are flushed back through the flutes that extend down the body of the tool. Star SU reamers are made in both multiple flute and multi-diameter types. They can have solid carbide heads brazed to a tubular steel body in sizes up to 2.0” diameter and with brazed inserts in 2.0” to 4.0” diameter ranges.